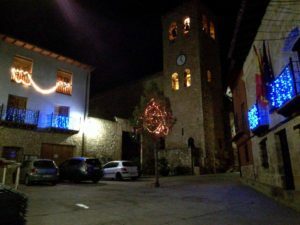 EL 28 DE DICIEMBRE DE 11.00H A 14:00 H. EN LA CASA DE LA CULTURA TENDRÁ LUGAR LAS JORNADAS NAVIDEÑAS DE LA COMARCA COMUNIDAD DE TERUEL CON JUEGOS , TALLERES Y FANTÁSTICAS SORPRESAS. EL 29 DE DICIEMBRE A LAS 16:30 H . EN LA CASA DE LA CULTURA NOS VISITARA EL PAJE REAL DE S.M. LOS REYES MAGOS DE ORIENTE PARA RECOGER TODAS LAS CARTAS DE LOS NIÑOS/AS. EL DIA 5 DE ENERO SOBRE LAS 18:30 NOS VISITARÁ S.M. LOS REYES MAGOS DE ORIENTE COMO YA VIENE SIENDO HABITUAL S.M. REPARTIRÁN LOS JUGUETES A LOS NIÑOS EN LA IGLESIA Y LUEGO REPARTIRÁN UN PEQUEÑO OBSEQUIO EN SUS DOMICILIOS A LOS MÁS MAYORES. EL DÍA 14 DE ENERO DE 2017 TENDRÁ LUGAR LA TRADICIONAL HOGUERA DE SAN ANTÓN . ESTA FIESTA TRANSCURRE DURANTE TODO EL DÍA YA QUE LOS MÁS JOVENES QUEDAN POR LA MAÑANA Y VAN A BUSCAR LEÑA DONDE ALMUERZAN PARA COGER FUERZAS . Y LUEGO AL HACER DE NOCHE SE PRENDE FUEGO A LA HOGUERA Y SE HACE UN ASADO POPULAR AMENIZADO POR UNA CHARANGA . APUNTARSE EN LOS ESTABLECIMIENTOS DEL PUEBLO. PLAN DE ASFALTO 2016 Y ACONDICIONAMIENTO Y DERRIBO EN LA CALLE CASTILLO .RESTAURACIÓN PLANTA BAJA AYUNTAMIENTO .